As a third grade teacher for over 10 years, I was always disappointed to see how many kids, especially girls, felt intimidated by math. And while society constantly reminds parents how important it is to read to their children – from literally the time they are in the womb – we don’t often hear the virtues of giving kids a strong background in numbers. But by helping your child not only identify the numbers, but to understand what they represent, you are giving her a solid foundation for success in mathematics to come. Teaching your toddler and preschooler number concepts doesn’t need to feel like a chore. In fact, it can be a lot of fun. Look for opportunities to use numbers and number sense in your everyday life. Numbers and mathematics are all around us. So count the number of apples you purchase at the grocery store, weigh and measure your child, and let her experience fractions as you bake together. Looking to add even more mathematics to your days? Here are some engaging, easy games and activities to incorporate more math into your time with your littles this summer. 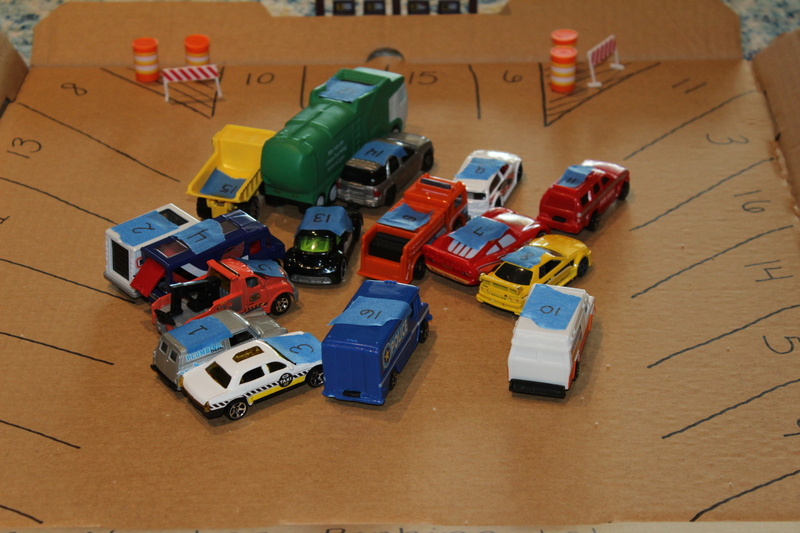 My kids love to play with cars and trucks, so this was a huge hit in our home. This simple number matching game is quick to set up and uses items you probably already have at home. I made the base out of a clean pizza box, but any large piece of cardboard or poster board will work. I placed numbered stickers on several of my kids’ cars using painter’s tape. Then I drew a parking lot and numbered the spaces. I decided to work on the numbers 1-20 since my kids were already pretty confident with the numbers 1 to 10. I didn’t want the game to be too frustrating, but I want to introduce some new numbers as well. First, I called out a number and they found the car and “parked” it in the correct space. Soon, they were playing the game on their own, calling out numbers to each other. Win! The only thing I wish I would have done differently is put the numbers in the parking lot on with painter’s tape, as well. That way I could have easily changed them and practiced skip counting and larger numbers. Playing board games or card games is a great way to sneak in some extra practice with numbers. When your child is rolling the dice or moving his piece on a game board, he is practicing number recognition and counting. One of our favorite games to play is a simple variation on the traditional card game, “War.” To make the game easier for my preschoolers, I remove the face cards and we use the ace as a 1, that way the picture on the card matches with the number. When we play I have the winner claim his cards using a complete sentence comparing the two numbers – “Eight is more than three.” After a few rounds my twins quickly understood the concepts of “more than” and “less than” and their very favorite, “equal.” I keep a deck of cards in my purse and pull them out when we have to wait somewhere. This is a great way to pass the time waiting at restaurants and doctor’s offices. Thanks to the invention of Pinterest, it is easy to find free, premade graphing activities appropriate for your child. I love to use seasonal treats (conversation hearts at Valentine’s Day, Lucky Charms for St. Patrick’s day, etc) or other fun snacks we don’t usually have as motivators for my four year olds. Graphs give children a visual representation of data that they can easily grasp. When you graph, have your child sort, count, and compare. 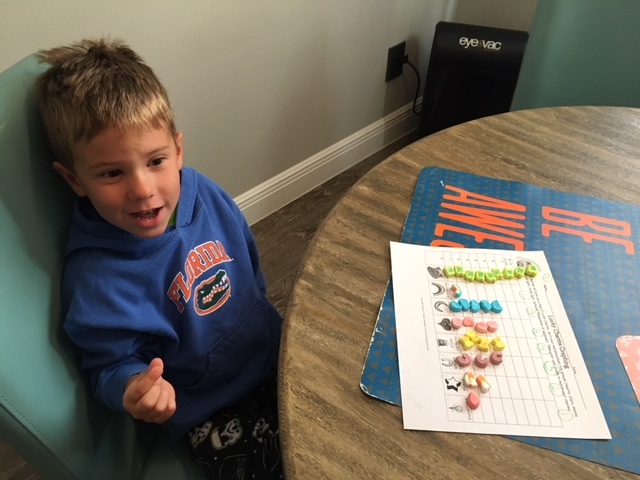 Ask questions such as “Do you have more red M&M’s or green?” “How many more?” As your children get older they can come up with their own mathematical statements or write questions for you to answer. Help your kids to see that math is a puzzle, a problem to solve, and encourage the process rather than rote memorization of the process. This way, your children will learn to love mathematics! What activities do you do that help promote number sense? Please share in the comments!